Further investigation reveals that passing in a URL to the fetchPasswordToRestore function returns a JSON payload containing all the inputs required log into a site such as the username and password. 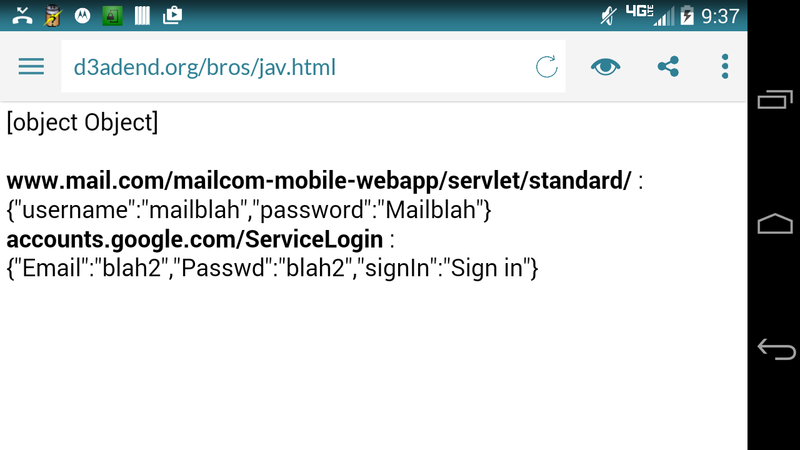 Therefore an attacker can trick a user using the Javelin browser to visit to the following malicious page that extracts out the victim’s credentials associated with mail.com and google.com assuming that those credentials exist in the victim’s password manager. Given that there isn’t a fetchAllPasswords style function exposed, the attacker might want to build a large array of potential target login URLs. Credentials acquired on a 4.4.1 device… On a sidenote, notice that the full class name and hash code associated with the injected Java object is no longer leaked by default. For those interested in how the password manager stores the login URLs and credentials, the Javelin browser stores all the relevant information in two XML shared preference files located in the the application’s private data directory (/data/data/com.nubelacorp.javelin/shared_prefs). The passwordStore.xml file contains the encrypted credentials. The browser uses the AES algorithm and the ECB mode of operation to encrypt the credentials. 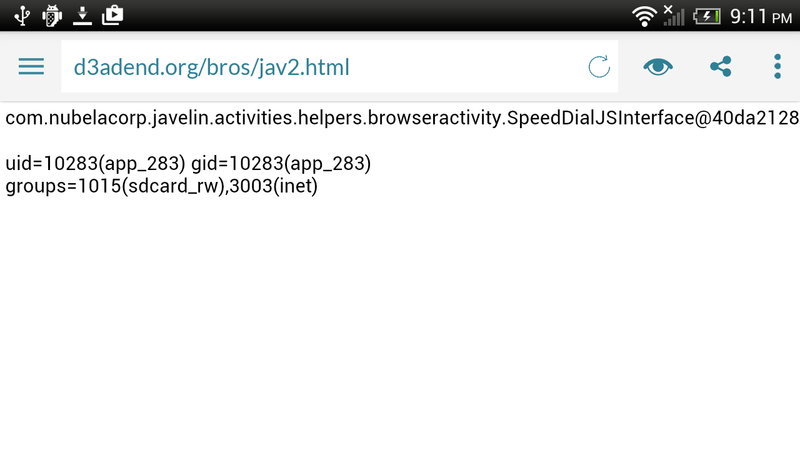 The details of the encryption can be found in the com.nubelacorp.javelin.activities.helpers.browseractivity.f class. Ideally, ECB shouldn’t be used, but where are the encryption keys? The encryption keys used to encrypt the credentials are stored in plaintext in the keyStore.xml file. You’ll notice that the login URLs are not actually stored in plaintext either, but they are stored in a hashed form in the XML documents as the name attribute value. For example, if we pass in accounts.google.com/ServiceLogin URL to the fetchPasswordToRestore function, then the browser uses SHA-256 to produce b764b92d6b34157201a75cee42e041986c22b97445d95f741e6c34defeb010c5. The browser can then look up the encryption key, which is f5b6a6e-c79e-4e3c-8408-d59ae835473d or 31 66 35 62 36 61 36 65 2D 63 37 39 65 2D 34 65 33 63 2D 38 34 30 38 2D 64 35 39 61 65 38 33 35 in ASCII hex after the last four bytes have been removed. Then the browser can look up the cipher text which is gZDjZMOarLvRG4EKT3pUjAmisqTsH7ei1yXMS-0xxsm-7XNOQRkmvFcSukZuIfoLbG1Be0UPdEtcvFA6ivItPW9Tx50cSE2xh9O2KSwbo7g= (non-standard base64 encoded) and decrypt the information using AES/ECB in order to acquire the following plaintext. The JSON payload contains all the relevant HTML input values required to submit to Google’s login page.